Queen Margrethe is one of the royals who attaches great sentimental meaning to the pieces of jewelry that she wears. She knows the history of her collection and, as the De Kongelige Juveler documentary demonstrates, she can easily recall the stories behind each item in it. Today's piece, her daisy brooch, is one of the most sentimental of her jewels, with connections to her mother and her maternal grandmother. In 1935, Princess Ingrid of Sweden, the only daughter of the Swedish crown prince, became engaged to Crown Prince Frederik of Denmark. Ingrid's mother, Margareta, had died fifteen years earlier, when Ingrid was only ten. Margareta had a stellar royal background of her own; born Princess Margaret of Connaught, she was descended from the British and Prussian royal families. She also had major jewelry -- we discussed several of her pieces here on the blog in January. As you might expect, Ingrid remembered her mother in multiple ways at her wedding, which took place in Stockholm. She wore her mother's wedding veil, a piece of delicate Irish lace that has also been worn by family brides in the generations since. She also had a rather large diamond brooch pinned to her wedding gown. The piece, which was made in the shape of a daisy, was one of Ingrid's wedding gifts. Her father, Crown Prince Gustaf Adolf of Sweden, had the brooch made for his daughter using diamonds that had belonged to her late mother. 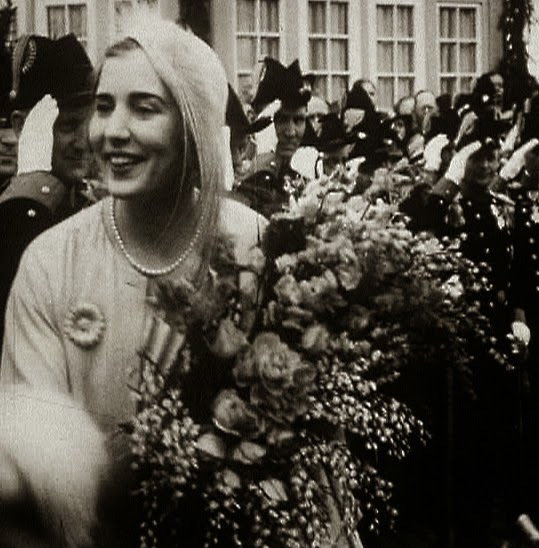 After her wedding, she also wore the brooch on her arrival in her new country, Denmark. 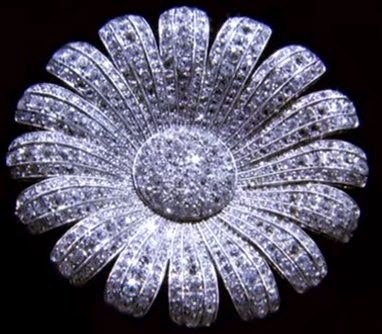 The diamonds alone would be a lovely sentimental connection to the late Swedish crown princess, but the shape of the brooch was another tribute to Margareta. The French version of her name, Marguerite, is also the name of a specific kind of daisy. The late princess was always called "Daisy" by her family, and so the brooch's design was another tribute to Ingrid's mother. Ingrid would go on to name her first child "Margrethe," and like her grandmother, the current Danish queen is nicknamed "Daisy." As you might expect, Ingrid treasured the brooch. She wore it on major occasions throughout her life, including her seventieth birthday celebrations in 1980 (pictured above with her daughters, their spouses, and her grandchildren -- can you name them all?). In June 1967, she lent the brooch to Margrethe to wear on her wedding day. 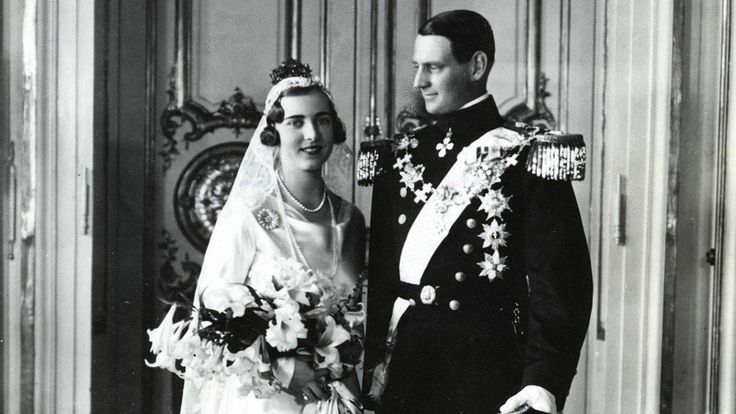 Margrethe followed in her mother's footsteps by pinning the brooch to the bodice of her wedding gown. Shortly before her death, Queen Ingrid gave the daisy brooch to Queen Margrethe as a birthday present. The queen's emotions over the sentimental gift are clear in her interview for De Kongelige Juveler: "Ten years ago, when I was sixty, on my birthday, my mother had just turned ninety. She gave me the daisy brooch, which I must say, I was extremely touched, to be given it like that. Well, it's a brooch which means a great lot to me, first because it was my mother's, and then again because I wore it for my wedding, and then I was given it the way I was given it like that, when I was sixty. That was very special" . 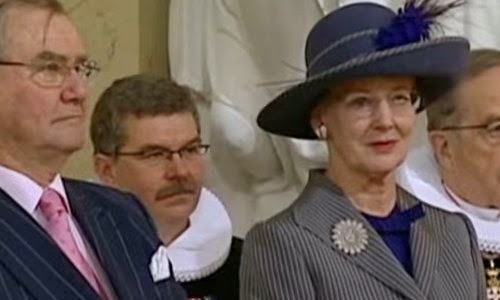 Since receiving the brooch, Margrethe has worn it at important events, including the celebration of her seventieth birthday in 2010 (pictured above). It's clearly one of her most treasured items. 1. Cropped still from a YouTube video; source here. 2. Cropped still from a YouTube video; source here. 3. As of the date of this posting, you can view the documentary here on YouTube.